If one day, when we’re driving along we suddenly find ourselves in a crazy car accident, we really want to be sure our kids are as well protected as they can be. But picking out a convertible car seat is SO HARD—there are so many and it’s a pretty big investment (especially since you may ultimately end up needing one for each kid, for each parents’ car). 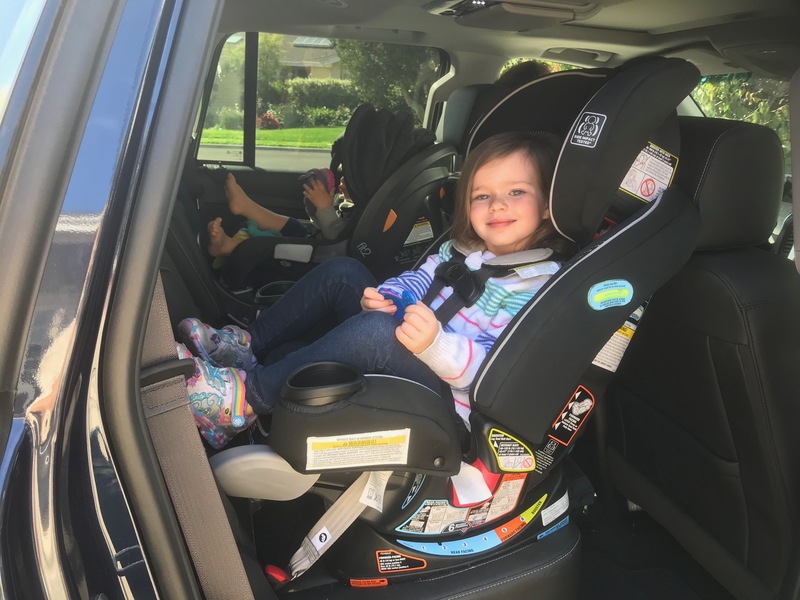 At a recent kid products expo, I made it my mission to check out the best car seats from the best manufacturers, so I could write reviews on the very best of the best. First off, my daughter is still rear-facing at nearly 4-years-old (there’s tons of info indicating rear-facing is safest, and I’m obsessed with safety). I prefer not to squish her into a tiny place like a little twisted-up pretzel, though. So, I was really fascinated by the new Graco top-of-the-line car seat, that has a rigid panel that extends under a child’s feet giving a few inches of extra foot room. This seat also can eventually convert to a booster (super-nice—so we don’t have to turn around and go buy something new in a few years). Of course, there are a zillion other things that are important in a convertible car seat (easy loading/unloading, accessories like cupholders, easy adjustments, easy cleaning)… this seat had really clever and cool features for handling all of those, too. So, we tried the Graco 4Ever Extend2Fit. I actually have a confession, we love it so much, my daughter has been in there for 6 months and we haven’t even gotten to the next car seat yet. Anyway, here’s the deal on the good, the bad, the creative/different features, and whatever else you might want to know about this seat. The instructions were a bit confusing, and installation took a while… but, hey, it is a car seat, and that’s kind of how it goes with most car seats (we’d suggest getting any car seat installation double-checked by a professional anyway). Once it was in, it felt extremely secure. Also, the car seat has a level with a bubble indicator, to help confirm that we’d installed it correctly, when we were done (which we love). The seat has nice low-profile sides, which is so helpful for getting a child in without bumping their head. My daughter actually can climb right in, by herself, which is amazing. The seat has spaces where you can put the seat belt buckles so they’re out of the way for loading, and the buckles fasten securely without much effort—she can even fasten them herself (when she’s in a cooperative mood). This car seat comes with two built-in cupholders, which are actually a really big deal—my daughter stores a sippy cup in one, and uses the other as a holder for toys. It makes her see the seat as a toy, which makes her more excited to get in—awesome. This car seat supports rear-facing up to 50lbs and has an option for extending a rigid panel under the child’s feet… extra foot room as the kiddo grows. There’s still plenty of room for the car seat on our car’s seats, even with the foot panel extended. Also, big bonus—my daughter uses the “foot rest” (as we’ve nicknamed it) as a special safe holding place, where she leaves her toys when she goes to preschool—that helps us to get her out (I’m not sure this would be a feature for other families, but again, she sees the car seat as fun, which helps us in a lot of ways). This seat can grow with a child from 4lbs to 120 lbs… it can eventually convert to a booster seat, then a backless booster. The theory is: it’s all you’ll ever need. It has a “no rethread” harness, meaning you can adjust the head rest and harness (they’re attached), super easily, by just sliding them up or down. Last, it has 6 positions for reclining. This seat is certainly among the best (or possibly it is the best) that we’ve seen when it comes to feature set. If you’re looking for the safest car seat, there really aren’t independent tests with publicly shared results for US car seats. Consumer Reports only tests a few seats, and doesn’t effectively share safety comparisons, in my opinion. So, in terms of safety, you’re primarily looking for a seat that: 1) you can correctly install, 2) you can use correctly every time (belts fasten tightly and stay in proper position), and 3) supports rear-facing for your family’s situation and car for as long as possible. Also, some car seat companies build in additional safety features or do additional testing beyond what the safety standards require. The Graco 4Ever Extend2Fit was tested at double the crash pulse required by government regulations, and they did voluntary side-impact testing. Also, they did environmental testing, where they subjected the seats to extreme temperatures then crash tested them. Good stuff. The seat is steel-reinforced with lots of energy-absorbing foam in the seat and headrest, and it’s designed to last for 10 years of use. More good stuff. The fabric is easily and quickly removable and it’s machine-washable. The car seat appears to be very comfortable and our daughter doesn’t get sweaty in there. It’s well padded, but there isn’t so much padding that her head is crowded or anything. It’s a good-looking car seat and it already includes the accessories that we’d want. Thank you to Graco for providing me with this great seat for this review. This entry was posted in Mama Lovejoy, Product Reviews, Travel and tagged #4ever, #best convertible car seat, #best convertible car seat 2017, #best convertible car seat 2018, #car seat, #car seat features, #car seat review, #car seat safety, #CarSeat, #carseatsafety, #comfortable rear-facing, #convertible car seat, #convertible seat, #extend2fit, #extended rear-facing, #extendedrearfacing, #Graco, #Graco 4Ever Extend2Fit, #Graco4EverExtend2Fit, #product review, #rear-facing, #rear-facing foot room, #rear-facing leg room.